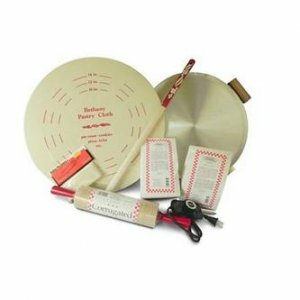 This Lefse griddle kit from Bethany, makers of quality Scandinavian housewares, includes everything you need to make authentic Norwegian lefse at home: a quality grill and turning stick for baking the dough, plus lefse mix, a special rolling pin with cover, and a pastry board for making and flattening out the dough (see bullets for full details). The included aluminum grill is great for making traditional sweet or savory lefse (a type of flatbread) rolled up with jam, cinnamon-sugar, or lutefisk. But the large 16" flat surface of this electric grill is also great for grilling steaks and burgers, cooking pizzas, frying eggs and bacon, and more. A deep outer rim helps to contain excess dough, oil, and batter from spilling over the edge. Grill plate is made of aluminum with a satiny luster. Has a wide temperature range for simple warming applications (tortillas, etc.) all the way up to 500° F for proper lefse grilling. Safety features include heat-resistant legs and hardwood handles.